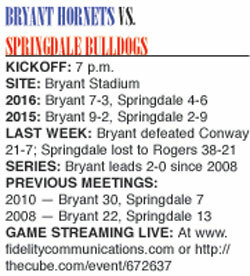 Yes, the Springdale Bulldogs are 4-6 but that record needs to be put into context as they prepare to challenge the Bryant Hornets tonight at Bryant Stadium in the first round of the Class 7A State playoffs. First, that 4-6 came against the rugged 7A-West Conference including a trio of top five teams, Fayetteville, Bentonville and Springdale Har-Ber. They narrowly lost to Bentonville West, 42-40. Second, the Bulldogs were sent reeling when their best player Kyler Williams was killed in an auto accident after their fourth game this season. He had caught 30 passes for 582 yards and seven touchdowns to that point. They had won three of those four games, with their wins including a 37-30 decision over Conway, Bryant’s 7A-Central Conference rival that the Hornets defeated 21-7 just last week. Since that heart-wrenching tragedy, they’ve won once in six games, which sounds bad until you note that those three powerhouses accounted for three of those five losses. Meanwhile, Bryant has won five of its last six games after losing to another common foe, Fayetteville. Hornets head coach Buck James reports that Springdale is tooled with big, strong linemen on both sides of the ball. “They’re a lot bigger than we are but most every team we’ve played this year is,” James said. “That’s not a big problem for us. Our endurance, our speed and the way we carry our pads is definitely an advantage for us. “We’ll have to pass it well and defend the pass well,” he said. Quarterback Layne Hutchins has completed 148 pass of 255 attempts with 12 interceptions but 18 touchdowns while accumulated a whopping 2,114 yards. His top receivers are Alex Thompson (35 receptions, 586 yards and five touchdowns) and Jayden Michew (34 receptions, 473 yards and two TDs). On the ground, Erick Mendez has rushed for 573 yards and eight scores. Garrett Vaughan was added 415 yards and three scores. 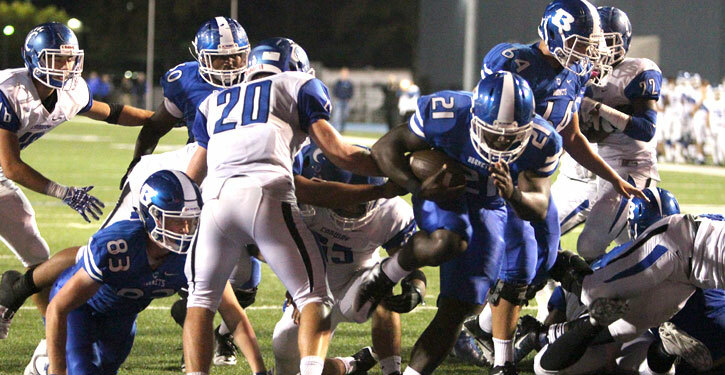 Hutchins, a dual threat at quarterback, has rushed for 215 yards and two touchdowns. That’s all part of 3,441 yards of total offense. Bryant’s defense has allowed 2,708 yards of offense while the offense has put together 3,030 yards. Both Ren Hefley and Beaux Bonvillain have produced at quarterback with top receiver Reece Coates helping out in the Wildcat formation at QB. On the ground, Cameron Coleman leads the team with 372 yards rushing despite missing the first few games. Jeremiah Long is right with him with 345 yards on the ground. The Hornets, too, have lost only to quality opponents. Both Fayetteville and North Little Rock are conference champions and top-seeded teams. Fort Smith Northside is a 2 seed. This is the 16th consecutive season in which Bryant teams have advanced to the playoffs.